Gene Hack, director of C4 Columbus Area Career Connection, watches a commercial construction crew lay cement blocks for a dugout on Aug. 30, 2012. 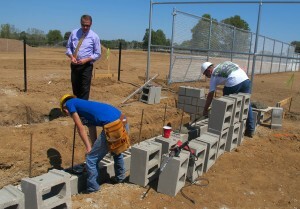 Students in the building trades program are working with professionals to build a new baseball stadium. Columbus employers says career and technical education programs help curb 'brain drain' in the region. Miranda Fox thought she wanted to be an architect. But after taking a drafting class through her high school’s career and technical education program, she couldn’t imagine spending the rest of her life sketching homes. So her teacher suggested she give construction management a try. The next year Fox helped oversee peers enrolled in C4 Columbus Area Career Connection’s building trades program as they built a residential home. She learned skills that helped her land an internship with a local construction company. Cummins and other employers in Columbus who support local career and technical education programs say the partnerships are two-way streets: They provide financial assistance to local schools in exchange for high school graduates who are better prepared to enter the workforce — and more likely to stay in Indiana. “Brain drain” is a problem in many Indiana cities. An Indiana University report released last year found that only about 43 percent of students who graduated from a public university in 2000 remained in the state five years later. The problem is even more pronounced among graduates with higher levels of education degree attainment. In Bartholomew, Brown, Decatur and Jackson counties — the region C4 serves — 60 percent or more of 2009 college graduates remained in Indiana a year later. Anecdotally, many Columbus employers say the connections students make in high school through career training programs encourage them to return to the area after continuing their education elsewhere. Take Fox, for example. The internship she had with Taylor Brothers Construction right after high school led to other internship opportunities in other Indiana cities. But when Taylor Brothers offered her a job when she graduated from college, she decided to stay in Columbus. Columbus Police Chief Jason Maddix points out that there’s a significant cost associated with training new officers — about $40,000. So he likes seeing job applicants who graduated from the C4 protective services program before going on to get their degrees. “They have ties to Columbus. They’re less likely to leave the department in three or four years,” Maddix says. The police department isn’t the only employer in town that sees significant savings in local career and technical education graduates. Steve Mackey, a learning and development leader at Cummins, says career and technical education is an important check employers can use to make sure applicants will like the work they’re hired to do. So Cummins gives a hiring preference to applicants with technical training. What Columbus employers say they’re seeing with C4 graduates may be part of a broader national trend. Alisha Hyslop is assistant director of public policy for the Association for Career and Technical Education, a group that advocates for better career training while students are still in school. Hyslop says she’s not surprised Columbus employers are seeking an uptick in applications from graduates of local career and technical education programs. But she says if C4 and other programs really want to be successful in curbing brain drain, then they need to challenge the perception that career and technical education attracts low ability students. Students repair a broken machine during a C4 Columbus Area Career Connection class on Aug. 30, 2012. Part of the machine trades curriculum is learning how to fix the equipment they use in class every day. Hyslop says numerous studies have shown students enrolled in career and technical education programs keep pace with their peers on high school exit exams and other standardized tests. In 2009, about 80 percent of U.S. students enrolled in career education classes passed high school English language arts assessments. That’s right on track with the target pass rate for all students. Of course, Hyslop concedes that the biggest reason brain drain occurs is because graduates can’t find jobs in the cities or states where they grew up. That tracks with what David Audretsch, an IU professor of economic development, told StateImpact last year. He says Indiana’s failed to market itself as a place recent graduates want to live and work. But other states have changed their image in recent years. Hyslop says Alabama used strong career and technical education programs and the promise of skilled laborers to lure manufacturers to the state. Now it’s No. 5 in the country for automotive production.